I have but one word for this year’s Oshkosh extravaganza. The VAA area of operations proved yet again to be a resounding success with another safe and successful venue with all the “Round Engine Rodeo” folks. I was absolutely amazed at the number of owners of these amazing machines that made the effort and commitment to bringing their unique aircraft to display them at Oshkosh in this very special event. Between the Round Engine Aircraft and the record number of returning Past Grand Champions who came to Oshkosh this year, the display area proved to be nothing short of amazing. Thanks for being there! How can we ever appropriately thank you all for your efforts and commitment to be there? Well, one way is to plan and execute yet another venue of rare and unique aircraft for the 2014 event. Be assured, the planning has already begun! I certainly hope you all had a great time at AirVenture 2013. It goes without saying that we also sincerely appreciate the planning, commitment and execution of yet another safe event by our valued Volunteer forces within the VAA. We actually saw 535 Volunteers sign-up for duty in the VAA area. These Volunteers came to Oshkosh from 40 different States, three Canadian Provinces, and six foreign Countries. We parked well over nine-hundred aircraft during the week, and we hosted some of the most unique Vintage aircraft from all over the country. Add to all of that excitement the JetMan performance, two spectacular night air-shows, the Disney Planes Premier, a record number of Commercial Exhibitors, plus, over 2,000 International visitors from 64 nations, and you can begin to feel the real success that Oshkosh AirVenture truly is. If you missed the 2013 Event, we certainly hope to see you there next year. This year at AirVenture we had an amazing collection of beautifully restored vintage aircraft. The Grand Champion Gold Lindy award winners are shown below for each category. Click here or on an image below to see all our award-winning aircraft. Each year the Vintage AirVenture leadership team selects two volunteers of the year – one on the flightline and one behind-the-scenes. This year both awards were presented to deserving couples who volunteer together. Learn more about these great people in next month’s Vintage Airplane. Vintage President Geoff Robison (right) presents the 2013 Behind-the-Scenes Volunteer of the Year Award to Judy and Ray Johnson from Marion, IN. Vintage Flight Line Chairman Mike Kosta (center) presents the 2013 Flight Line Volunteer of the Year Award to Margy and Ron Natalie from Herndon, VA.
That is the slogan of the group we are presenting in this month’s vintage airport feature. The airport where this organization is located is the Palmyra Airport in southeast Wisconsin and the designator for the field is 88C. This is truly a grassroots effort that is making a difference in the world of aviation. The name of the group of dedicated volunteers is 88Charlies, Inc. named after the airfield. 88Charlies Restore a Plane Foundation is a non-profit organization dedicated to promoting aviation by giving students the opportunity to restore aircraft. This airplane appeared in the early 1920’s and incorporated several unusual design features. Also, can you name the well-known individual who performed some of the test flying of the aircraft? Click here or in the image below to view the full size image. Two of our young adult volunteers exemplify the FUN of Vintage at AirVenture. Alex (Spike) Gluhushkin and Mike (Orphan 1) Carlson grew up at Oshkosh… first doing only those jobs kids were allowed to do…. then riding scooters and parking planes. As adults they have each moved into important behind-the-scenes volunteer jobs… but in their spare time they still make it… FUN. Click here or on the image below to enjoy Mike and Spike’s view of a volunteer’s day at Oshkosh. Mystery Airplane #2 Identified PlRoy Oberg was the first and only reader to correctly identify our last issue’s mustery aircraft. 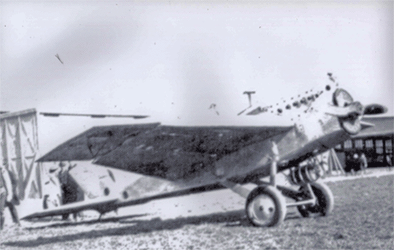 Click here or on the image below to learn more about this plane.